This stylish humidifier helps you control moisture in the air while adding a sleek touch to any room. Sleep soundly through the night without having to refill the 0.66 gallon tank. It has the capacity to run nonstop for 24 hours. Plus, it's whisper quiet so it won't disturb your busy lifestyle, your sleep or your work. The filter free feature means that you don't have to stop in the middle of your day and replace costly filters. Easy! The water tank is naturally protected against the growth of harmful germs one less thing to worry about. Sleek and Stylish. This vibrant blue and white humidifier will add a sophisticated touch to any décor. The 100-hour* Ultrasonic Warm and Cool Mist Humidifier guards against problems caused by dry air in the home. It features an easy to fill large 1.5 gallon tank, ideal for use in medium sized rooms. Unlike other humidifiers that grow slimy mold on the water tank surface, Silver Clean Protection is embedded in the tank to fight the growth of mold and mildew on the surface of the water tank. Thanks to ultrasonic technology, it disperses a fine mist into the air, and is ultra-quiet making it ideal to have on while you sleep. The humidifier is equipped with the option for warm or cool mist, a night light and variable mist control. A low water indicator light lets you know when it's time to refill the water tank. The PureGuardian<sup></sup> 90-Hour* Smart Mist Ultrasonic Humidifier guards against problems caused by dry air in the home, making life pleasant for those with cold, flu, allergies and dry skin. A Smart Mist sensor monitors the humidity level in the room and adjusts accordingly to maintain a consistent humidity level. Silver Clean Protection fights the growth of slimy mold and mildew on the surface of the water tank. Thanks to ultrasonic technology, it is ultra-quiet when it runs making it ideal to have on while you sleep. 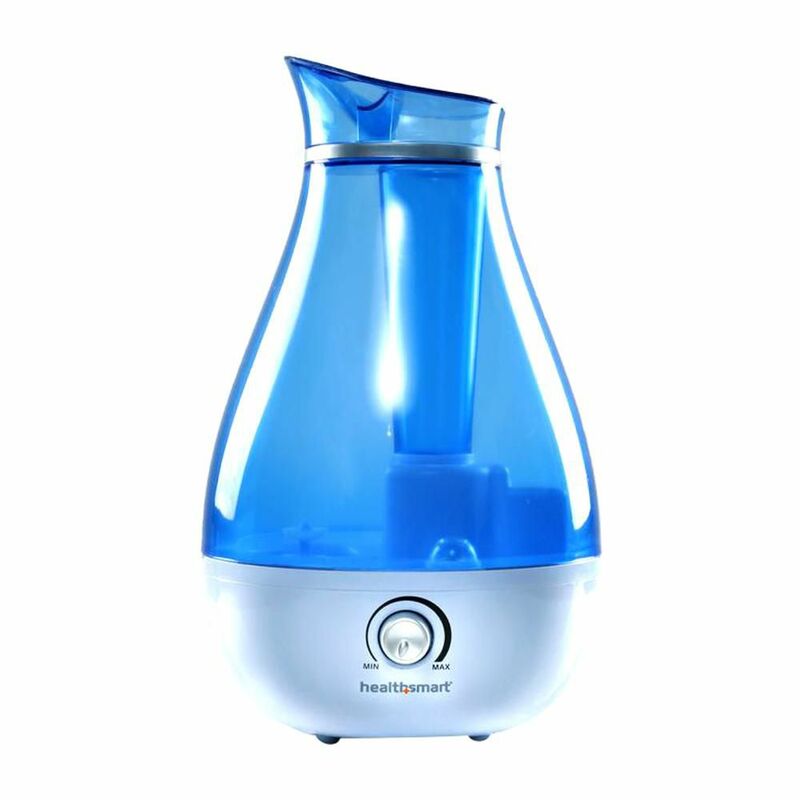 The humidifier is equipped with the option for warm or cool mist and has a light that turns red to let you know when its time to refill the water tank. A timer allows you to customize the desired run time for up to 12 hours. It features a soft glow night light that turns on and off and easy-to-use digital controls. Ultrasonic Cool Mist Humidifier by Guardian Technologies. PureGuardian 10-hour ultrasonic cool mist humidifier guards against problems caused by dry air in the home. It features an easy to fill 0.21 gal. tank, ideal for use in small sized rooms. other humidifiers that grow slimy mold on the water tank surface, Silver Clean protection is embedded in the tank to fight the growth of mold and mildew on the surface of the water tank. Thanks to ultrasonic technology, it disperses a fine mist into the air, and is ultra-quiet making it ideal to have on while you sleep. The humidifier emits a soothing cool mist, and a low water indicator light lets you know when its time to refill the water tank. Night light feature makes it a great addition to kids rooms. 100-Hour Cool & Warm Mist Humidifier with Aromatherapy Tray and UV-C Guards against problems cause by dry air in the home. Makes life pleasant for those with cold, flu, allergies and dry skin. Treated with Silver Clean to fight the growth of slimy mold and mildew on the surface of the water tank a common problem with traditional humidifiers. Ultra-quiet: perfect for all including sleeping children. Ultra-quick: immediately begins to disperse a fine, even mist creating a comfortable environment. Ultra-easy: eliminates evaporating filters that must be cleaned or replaced and breed mold and mildew. Mist XP Cool Mist Ultrasonic Humidifier This stylish humidifier helps you control moisture in the air while adding a sleek touch to any room. Sleep soundly through the night without having to refill the 0.66 gallon tank. It has the capacity to run nonstop for 24 hours. Plus, it's whisper quiet so it won't disturb your busy lifestyle, your sleep or your work. The filter free feature means that you don't have to stop in the middle of your day and replace costly filters. Easy! The water tank is naturally protected against the growth of harmful germs one less thing to worry about. Mist XP Cool Mist Ultrasonic Humidifier is rated 3.8 out of 5 by 4. Rated 5 out of 5 by Bobalouie from Had our first for three years. Great humidifier. It needs NO filter. It lasts almost 24 hours.... Had our first for three years. Great humidifier. It needs NO filter. It lasts almost 24 hours. We now have three of them. Rated 1 out of 5 by EDragon from Fill the tank and set it on the nightstand. Next day the thing leaked. Good thing I had the sen... Fill the tank and set it on the nightstand. Next day the thing leaked. Good thing I had the sense to put a towel under it just in case. Seems like junk to me. Rated 5 out of 5 by Jack from .Room Humidifier My wife and I both suffered from nose bleeds in winter... Our doctor suggested we buy a humidifier. This product does the job. ... No more nose bleeds.